Botox can be used to adjust the appearance of the eyebrows. While it is injected in various places in the face and other areas of the body, the most common areas for Botox treatment are the upper face. 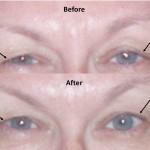 The muscles treated with Botox all affect the position of the eybrow. The first area to be approved by the FDA is the frown lines, the vertical lines between the eyebrows seen when we frown. The muscle here pulls the eyebrows in and down, so relaxing the muscle (which is what Botox does) causes a lifting of the eyebrows. Another muscle commonly treated with Botox goes around the eyes and creates the crow's feet when we smile or squint. When squinting very hard the outer portion of the eyebrow moves down. So relaxing this area with Botox will also lift the brow. These treatments can also help with hooding of the upper eyelid, creating a more open eye and giving a rested and refreshed appearance. Treatment of the horizontal lines on the forehead with Botox relaxes the muscle that lifts the eyebrow. If done improperly, this relaxation can cause a heaviness in the eyebrow and bring it down. If the full muscle is not treated sometimes the outer parts of the brows are lifted while the inner parts are not, giving a joker look. 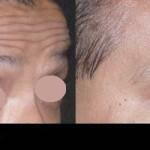 Fortunately this can be treated easily by injection of a small amount of Botox on the forehead in the right spot. With all these muscles around the brows, there are many possibilities for adjusting the appearance of the eyebrows with Botox. However, it is important to get the treatment from a provide with experience to avoid the many side effects. Dr. Alex only does cosmetic treatments and has years of experience treating patients with Botox and other injectables such as fillers as well as other treatments such as the Forever Young BBL IPL photofacial and chemical peels. He has designed a painless Botox technique for a comfortable treatment. Take a look at some of his Botox before and after pictures. Contact us for a free consultation.